Tracing the early evolution of Black Wall, this In Focus reveals Nevelson as a collector and scavenger on the streets of New York, and features a newly digitised interview with the artist by critic David Sylvester. 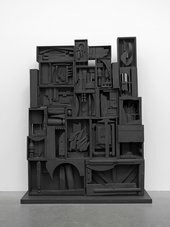 Louise Nevelson’s Black Wall 1959 is a sculptural assemblage comprised of twenty-four wooden boxes arranged in the style for which the artist would become famous. This project reconstructs, for the first time, the changing composition of this key sculpture and unpacks its complex early history. Made from materials found in the street, Nevelson’s early ‘walls’ are further explored in this In Focus through her habits as a collector and their connections to the Manhattan neighbourhood of Kips Bay in which she lived. Sylvester’s interview with the artist from 1964, in which she speaks about the making of works including Black Wall, offers additional insight into the work’s creation. Published in April 2016, the project is authored by Alex Taylor (Terra Foundation Research Fellow in American Art, Tate), Mark Liebenrood (independent art historian) and Elyse Speaks (Assistant Professional Specialist, Art History, University of Notre Dame.